2018 marks the sixth year that I attended the Congenital Heart Legislative Conference in Washington, DC. Nearly 200 advocates from across the country—the largest number to date—descended on the nation’s capital for this annual event. Given the current political climate, like last year, I initially approached this year’s event with some apprehension and skepticism. Yet there’s something about this event that continues to inspire me year after year—the people who participate. I am fortunate to have built some close friendships with fellow advocates over the years; and seeing them is always such a joy. But equally rewarding is seeing all the new people who come to this event each year—whether they are fellow CHD patients (of all ages! ), parents, spouses, siblings, or medical professionals. While the pace of progress in DC can often be painfully slow, we were fortunate to witness the passage of the Congenital Heart Futures Reauthorization Act (CHFRA) in the House (H.R. 1222) on the eve of our Hill visits. It was a huge win and a critically important step on what is a very long journey. In a world that often looks for instant gratification, it is heartening to see the steadfast commitment of so many people who are committed to making progress—whatever the pace. The saying goes that slow and steady wins the race, and I couldn’t be more hopeful that it’s true. But I also think we’re at a critical moment—one in which the entire CHD community needs to begin working even more closely together. We have accomplished many great things already, but I sincerely believe that a more unified approach will make our voices even stronger and increase the pace of our progress on all fronts. 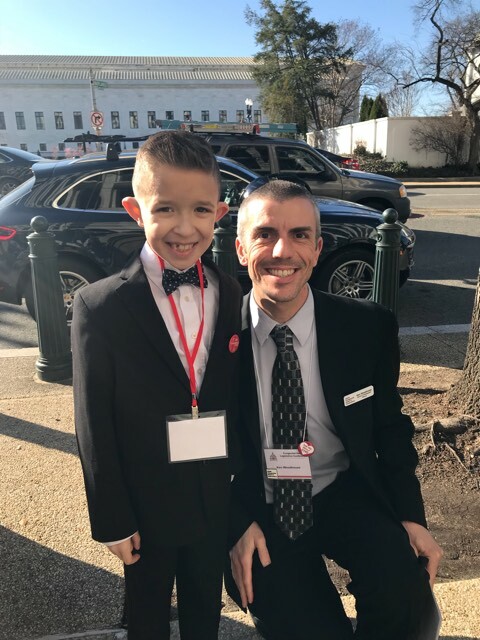 I firmly believe that we owe it not only to ourselves, but—more importantly—to Luke and to his peers to work more collaboratively toward achieving our shared vision of a better future for all who are living with CHD.